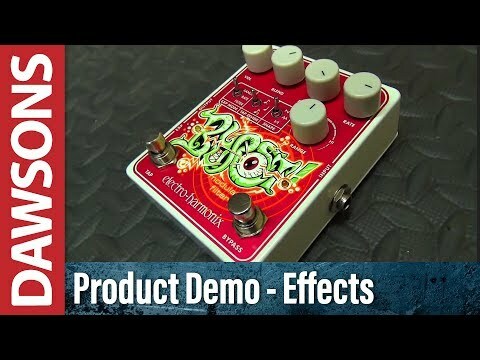 The Electro Harmonix Blurst Modulated Filter Guitar Effects Pedal brings the brilliance offered in keyboard and modular synthesizers to guitarists and bassists in the form of this cool pedal. Modulating your tone like and envelope filter that is controllable via an internal low frequency oscillator (LFO), rather than your playing dynamics. The result takes your tone into new and unchartered waters, so dive in get creative. The all-analogue signal path features a fourth-order low pass filter with variable resonance. There are three waveform shapes that can be selected using the SHAPE toggle switch, which allows you to control the LFO. The modulation is controlled digitally, with a Tap Tempo control (with three tap-divide settings to choose from), whilst the addition of an expression pedal control enables you to switch between a further three parameters - the level of control is staggering! Getting started with the Blurst couldn't be simpler, simply connect your guitar to the input, and your output to the pedal/amp in your signal chain. The modulation rate can be set by using either the RATE pot or a combination of the TAP footswitch and TAP DIVIDE toggle switch. The SHAPE switch allows you to access a triangle, rising saw-tooth, or a falling saw-tooth waveform, depending on the tone you're looking for. The RANGE pot offers attenuation of the filter's frequency range, sweeping from lower to higher frequency ranges. The RESONANCE pot sets the resonance of the filter, affecting the output level accordingly. The BLEND pot control the blend of the dry and filtered signal, whilst the VOLUME pot adjusts the output volume. Incorporating an expression pedal offers real-time control over a range of options including the RATE, RANGE, or FILTER, depending on your stylistic preference. Everything from a subtle wobble to a swirling vortex of modulated tones, a sound steeped in tremolo or a spacey phaser-like effect, the Electro Harmonix Blurst Modulated Filter Guitar Effects Pedal can do it all. By pairing it with different pedals from overdrive to delay, reverb to expression pedals, you will have no end of fun exploring new sonic landscapes with this little beauty.